The AS350 is a single engine helicopter, powered either by a Lycoming LTS101 or Turbomeca Arriel powerplant (for twin-engined variants, see Eurocopter AS355), that drives a three-blade main rotor, which is furnished with a Starflex rotor head. The type is well known for its high-altitude performance and has seen frequent use by operators in such environments. Both the main and tail rotors make use of composite material and are deliberately designed to minimize corrosion and maintenance requirements. 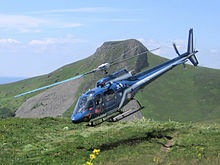 The AS350 was also developed to comply with the stringent noise requirements in place in locations such as national parks; the in-cabin noise levels are such that passengers may also readily converse during flight. The aircraft can also be quickly started up and shut down, which is often useful during emergency medical services roles. 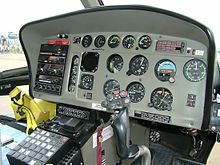 It is equipped with hydraulically-assisted flight controls; these controls remain operational, albeit operated with greater physical effort, in the event of a hydraulic failure. On 14 May 2005, an AS350 B3 piloted by Eurocopter test pilot Didier Delsalle touched down on the top of Mount Everest, at 8,848 m (29,030 ft), a record that has been confirmed by the Fédération Aéronautique Internationale. On 29 April 2010, a stripped-down AS350 B3 rescued three Spanish alpinists, one at a time, from the slopes of Annapurna I, Nepal at an altitude of 6,900 m (22,640 ft); this set a new record for the highest such rescue. The record was increased to 7,800 m (25,590 ft), during the rescue of Sudarshan Gautam between Camps III & IV in Everest's Yellow Band on the morning of 20 May 2013. On 2 June 2014, an AS350 B3e broke a national record in Mexico by successfully landing on the peak of Pico de Orizaba, the nation's tallest mountain. High-performance version, is powered by an Arriel 2B engine equipped with a single channel (DECU) Digital Engine Control Unit with a mechanical backup system. This helicopter is the first ever to land on the summit of Mount Everest. AS350 B3/2B1 variant introduces enhanced engine with dual channel (FADEC) Full Authority Digital Engine Control, dual hydraulics and a 2,370 kg (5,225 lb) Maximum Take Off Weight. AS350 B3e (introduced late 2011) equipped with the Arriel 2D engine; AS350 B3e renamed H125. Lesotho Defence Force - 3 in service as of January 2019. Qatar Ministry of Defence — 1 in service, 15 more on order as of January 2019. On 27 July 2007, two AS-350 AStar helicopters from television stations KNXV-TV and KTVK collided in mid-air over Phoenix, Arizona, while covering a police pursuit. On 11 March 2018, a chartered AS350 carrying six people (five passengers and a pilot) crashed into New York City's East River after reportedly suffering engine failure. All five passengers were confirmed dead after the aircraft submerged upside down into the water. The pilot was able to free himself and was rescued by a nearby tugboat. On 27 February 2019, an Air Dynasty AS350 B3e helicopter crashed shortly after takeoff in Taplejung, Nepal, killing all seven people on board, including Tourism and Civil Aviation Minister Rabindra Adhikari. On 25 March 2019, an Ecocopter AS350 B3  helicopter being used by Inter Chile with 6 people aboard crashed near Colliguay, Valparaiso, Chile at about 10 AM local time while transporting workers to a work area involved with electrical transmission lines. Four people died on impact and the other two died shortly thereafter. The pilot was a citizen of Spain. Ecocopter said the aircraft was up to date in all its permits and was airworthy reported TVN, the national broadcaster. ^ "Eurocopter AS350, AS355 & EC130 Technical Briefing. Archived 12 January 2016 at the Wayback Machine", Airbus Helicopters, February 2010. ^ Conklin & de Decker. "Airbus Helicopters AS350B2". Business Jet Traveller. ^ Fabre, François et al., "Final Report: Eurocopter AS350 Ecureuil/Single Engine Family, Revision 4. ", European Aviation Safety Agency, 8 June 2012. ^ a b c d e f "1974: AS350/355 Ecureuil/AStar- AS550/555 Fennec – EC130." Archived 26 December 2015 at the Wayback Machine Eurocopter, Retrieved: 25 December 2015. ^ Jackson 2003, p. 244. ^ Taylor 1982, p. 56. ^ a b c d e f Lombardi, Frank. "AStar Evolution. ", Aviation Today, 12 May 2015. ^ Osborne, Tony. "French Unions Dislike Eurocopter’s U.S. AS350 Plan. ", Aviation Week, 30 September 2013. ^ "Eurocopter to assemble AS350 aircraft in Mississippi. ", United Press International, 23 September 2013. ^ "First US-made Airbus Helicopters AS350 certified. ", Aerospace Manufacturing and Design, 3 March 2015. ^ Forrest, Ben. "Airbus aims to ramp up H125 production in Mississippi." Vertical Magazine, 22 December 2015. ^ a b c Stephens, Ernie, and James T. McKenna. "The AS350 — Versatility and Power. ", Rotor & Wing, 1 June 2007. ^ "AS350: Hydraulics Out? Fly the Procedure. ", Rotor & Wing, 1 June 2007. ^ a b c "Civil: H125." Archived 11 September 2015 at the Wayback Machine Airbus Helicopters, 2015. ^ a b c "Eurocopter’s Helibras Subsidiary to Modernize 36 AS350 Ecureuil Helicopters Operated by the Brazilian Army Aviation Command. ", Helicopter Maintenance Magazine, 1 February 2011. ^ "French Everest Mystery Chopper's Utopia summit". MountEverest.net. 27 June 2005. Archived from the original on 13 January 2015. Retrieved 20 March 2012. ^ "Landing on Air". National Geographic Adventure. 1 September 2005. Archived from the original on 2 August 2009. ^ "FAI Record ID #11596 – Highest take-off Archived 5 March 2014 at the Wayback Machine" Fédération Aéronautique Internationale (FAI). Retrieved: 20 September 2014. ^ "Helicopter Rescues in Everest's Western CWM?". Archived from the original on 23 July 2012. Retrieved 28 February 2012. ^ Bierling, Billi (October 2013). "The height of folly?". Action Asia Magazine. Archived from the original on 20 June 2015. When he fell at the Yellow Band during his descent, Gautam then set another landmark: for the highest helicopter rescue in the world. The Italian pilot Maurizio Folini took on the daring task and used a ‘long line’ from 7,800 metres to pull the 30-year-old off the mountain. The rescue may also cost Gautam his place in the Himalayan Database as, according to Hawley’s criteria, his climb is not complete. ^ Arnette, Alan (28 February 2014). "Everest 2014: Can I be Rescued on Everest?". ^ Sottocornola, Sara (23 May 2013). "Everest, record superato: incredibile recupero vicino a campo 4 per Maurizio Folini". montagna.tv (in Portuguese). ^ Wright, Brian (10 June 2013). "Daring High Altitude Rescue on Everest Sets Record". Rock and Ice, The Climber's Magazine. Archived from the original on 17 April 2015. ^ "AS350 B3e breaks record on Mexico's highest mountain. ", Vertical Magazine, 2 June 2014. ^ "Several California Law Enforcement Agencies to Use New AStar Model. ", Rotor & Wing, 3 March 2015. ^ "Congressional Record, V. 145, Pt. 11, July 1, 1999 to July 15, 1999. ", Government Printing Office, pp. 15192-15193. Retrieved 5 June 2015. ^ Schmidt-Creton, Vanessa. "Largest Astar Operator in the US. ", Airbus Helicopters, 12 July 2007. ^ "American Eurocopter Celebrates 200th American-Made AS350 Helicopter. ", AviationPros, 20 September 2012. ^ "Eurocopter Vostok Delivers First Enhanced AS350 B3e Helicopters for Utair Aviation, Which Will Become the Largest Ecureuil Operator in Russia and CIS." Eurocopter, 12 January 2012. ^ "Airbus Helicopters Receives EASA Approval for Joint-Venture Training and Support in China. ", Aviation Today, 15 December 2014. ^ Wen, Wang. "Heli-Expo launches with huge order for Airbus. ", China Daily, 9 September 2015. ^ "China Heli-Expo 2015" (3): "Chinese CMIFL sign agreement for 100 H-125/H-130 helicopters over five years. ", AvioNews, 9 September 2015. ^ "Zentech to support Brazilian aircraft carrier São Paulo’s upgrade programme. ", naval-technology, 7 May 2015. ^ Morant, Belen. "The Brazilian Navy: The Ecureuil in Antarctica. ", Rotor Online, April 2009. ^ "Eurocopter Unit Inaugurates Chopper Plant in Brazil. [permanent dead link]", defensenews, 2 October 2012. ^ "Elixir of Youth for AS350", SavunmaSanayi.Net, 6 January 2011. ^ "Squirrel HT1. ", Royal Air Force. Retrieved 6 June 2015. ^ Perry, Dominic. "UK MoD begins training helicopter acquisition. ", Flight International, 10 September 2014. ^ "Navy’s ‘Battle Budgie’ turns 30. ", australianaviation.com.au, 30 May 2014. ^ Ripley 2010, p. 297. ^ Guevara, Inigo. "Argentina signs MoU for 12 Airbus Helicopters H125s. ", IHS Jane's Defence Weekly, 29 June 2015. ^ "Ecureuil scores success in South America". eurocopter.com. Archived from the original on 24 December 2012. Retrieved 17 February 2013. ^ "Control and Prevention". Retrieved 18 December 2012. ^ a b c d e f g h i j k l m n o p q "World Air Forces". Flightglobal Insight. 2015. Retrieved 28 March 2016. ^ Lucchesi Air International June 2000, p. 377. ^ "PMMG Aeronaves". Retrieved 29 March 2016. ^ "R.C.M.P Helicopter". Retrieved 26 January 2005. ^ "New Edmonton police helicopter can fly faster, longer than its predecessor". Retrieved 23 February 2018. ^ Sanchez, Alejandro (30 November 2017). "Ecuadorian Army acquires two AS 350B3 helicopters". IHS Jane's 360. Archived from the original on 2 December 2017. Retrieved 2 December 2017. ^ "French National Gendarmerie AS350 ecureuil". Retrieved 17 February 2013. ^ "Hungarian Air Force AS350 ecureuil". Retrieved 27 May 2015. ^ "Iceland CG Aircraft". aeroflight.co.uk. Retrieved 17 February 2013. ^ "Fast and furious: The new police helicopters". israelnationalnews.com. Retrieved 21 August 2017. 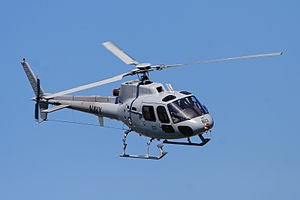 ^ "Kenya receives Fennec helicopters". IHS Jane's. 6 September 2018. Retrieved 6 September 2018. ^ Martin, Guy (January 2018). "Lesotho Defence Force H125". Air International. Vol. 94 no. 1. p. 23. ^ "Lesotho Defence Force receives H125 helicopter". Defence Web. 3 January 2019. Archived from the original on 3 January 2019. Retrieved 3 January 2019. ^ "Philippine National Police look to purchase 15 helicopters". HeliHub. 12 October 2012. Retrieved 8 October 2015. ^ Jennings, Gareth (24 January 2019). "Qatar receives first H125 training helos". Jane's 360. London. Archived from the original on 24 January 2019. Retrieved 24 January 2019. ^ "Anaheim PD buying third helicopter". Orange County Register. Retrieved 4 April 2017. ^ "Airbus delivers six H125s to four California law enforcement agencies". helihub.com. Retrieved 29 March 2016. 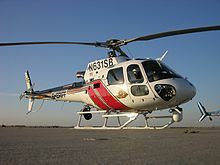 ^ "LASD Aero Bureau". code2high.com. Retrieved 3 September 2014. ^ Why Is That LAPD Helicopter Circling Overhead? ^ "N503PH – Aircraft Registration". FlightAware. Retrieved 5 April 2017. ^ "Oklahoma City Police Department unveils new helicopters". The Oklahoman. Retrieved 26 December 2015. ^ "Get to the chopper: San Jose police get a brand-new eye in the sky". San Jose Mercury News. Retrieved 30 July 2018. ^ "Southwest Border Region/ CPB". cbp.gov. Archived from the original on 24 March 2014. Retrieved 17 February 2013. ^ "CPB AS 350". Demand media. Retrieved 17 February 2013. ^ "Ukraine to buy new rotorcraft from Airbus Helicopters". Jane's 360. Retrieved 26 May 2018. ^ "Подписано межправсоглашение: в этом году Украина получит первые 4 вертолета Airbus Helicopters H225". LIVEJOURNAL. Retrieved 29 May 2018. ^ "4 Dead As 2 Helicopters Tracking Police Pursuit Collide". KPHO-TV. 2007-07-27. Archived from the original on 2007-09-27. Retrieved 2007-07-27. ^ Midair Collision of Electronic News Gathering Helicopters KTVK-TV, Eurocopter AS350B2, N613TV, and U.S. Helicopters, Inc., Eurocopter AS350B2, N215TV Phoenix, Arizona, July 27, 2007 (PDF) (Report). National Transportation Safety Board. 28 Jan 2009. Archived (PDF) from the original on 19 May 2009. Retrieved 28 July 2017. ^ Rose, Gareth; Watson, Jeremy (16 September 2007). "Rally ace Colin McRae dies in helicopter crash". The Scotsman. Edinburgh. Retrieved 16 September 2007. ^ Mukinda, Fred and Silas Apollo. "Chopper was 'new and powerful'". Daily Nation. 10 June 2012. Retrieved 13 June 2012. 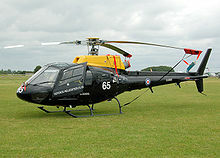 ^ "Kenyan minister George Saitoti killed in helicopter crash". BBC News. 10 June 2012. Retrieved 10 June 2012. ^ "Minister killed in Kenyan helicopter crash". aljazerra.com. 10 June 2012. Retrieved 10 June 2012. ^ "Former Brazil and Internacional striker Fernandão dies in helicopter crash". 7 June 2014. Retrieved 7 June 2014. ^ Justin Carissimo (11 March 2018). "5 killed in New York City helicopter crash on river". CBS News. Retrieved 12 March 2018. ^ "Seven people, including tourism minister, killed in a helicopter crash". Kathmandu Post. Retrieved 28 February 2019. ^ "Empresa EcoCopter asegura que helicóptero que capotó en Quilpué contaba con todos sus permisos". 24horas.cl. Retrieved 25 March 2019. Croucher, Phil. The AS 350/355 Book. Lulu.com, 2014. ISBN 1-92683-319-8. Wikimedia Commons has media related to Airbus Helicopters H125 Écureuil. This page was last edited on 14 April 2019, at 03:07 (UTC).